Hot cross buns. The name for these Easter treats always anthropomorphizes them in my eyes: rather than being crossed for religious reasons, I always imagine them as hot and bothered: a flustered little addition to any baking repertoire. Luckily making these lovely seasonal buns is anything but bothersome. 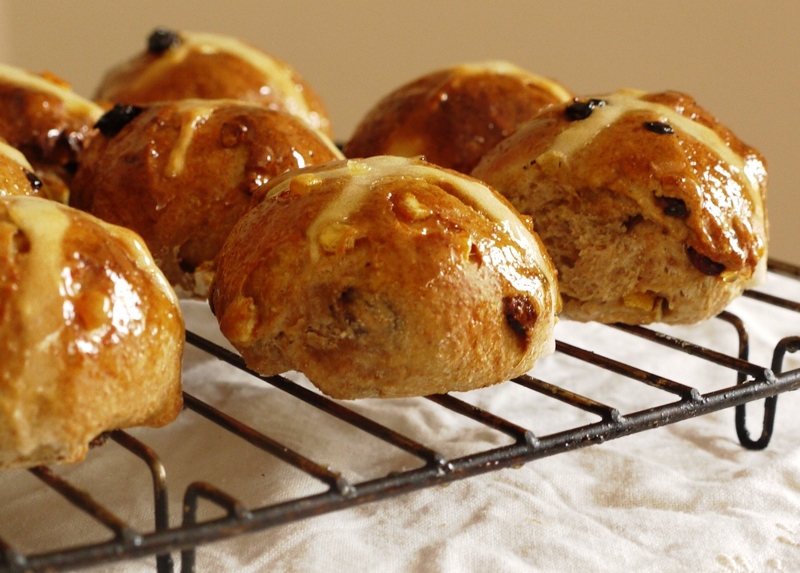 A simple enriched dough of flour, sugar, butter and egg is stirred through with mixed spice and additions of your choice – typically raisins, sultanas and candied peel, although chopped dried dates, apricots, cherries or even chocolate are all delicious alternatives – before being quickly kneaded, left to rise then divided into perfect little pillows and marked with a cross. This month I’m hosting the Fresh From the Oven challenge and I’ve decided to task anyone who wants to get involved with making spiced buns. With Easter just a few days away and the shelf-life of a homemade hot cross buns a little less than 48 hours, now couldn’t be a more perfect time to get baking. But don’t worry if you’ve been hugely organized and already baked a batch for your freezer – there are some suggestions below for alternatives to your standard hot cross bun, and the more diverse and imaginative the entries the better! Speaking of buns in the oven, and as it’s 1st April, what’s the worst trick you’ve ever played on someone for April Fool’s Day? When I was little my brother and I used to scheme up ideas of changing the time on the clock in our kitchen, waking our parents up in the middle of the night or exchanging the pot of sugar for one filled with salt. So when I got to university, I naturally thought it would be fun to extend this low level, entirely harmless enjoyment of practical jokes to my newly acquired nearest and dearest, Carniverous Boyfriend. It’s hard to imagine now after seven years together what our relationship was like after six weeks, but my twenty year old self obviously thought it would be hilarious to text him on April Fool’s Day with the news that ‘I’m pregnant…’ I quickly followed up with a second text ‘…with triplets!’ which I thought made it pretty clear that I was joking, but apparently on receipt of the first message he put his phone down, left the room and spent several traumatized minutes wondering how he should feel and what on earth he was going to do with this unexpected and slightly scary news. Oops. Anyway, back to a less controversial bun in the oven . . . 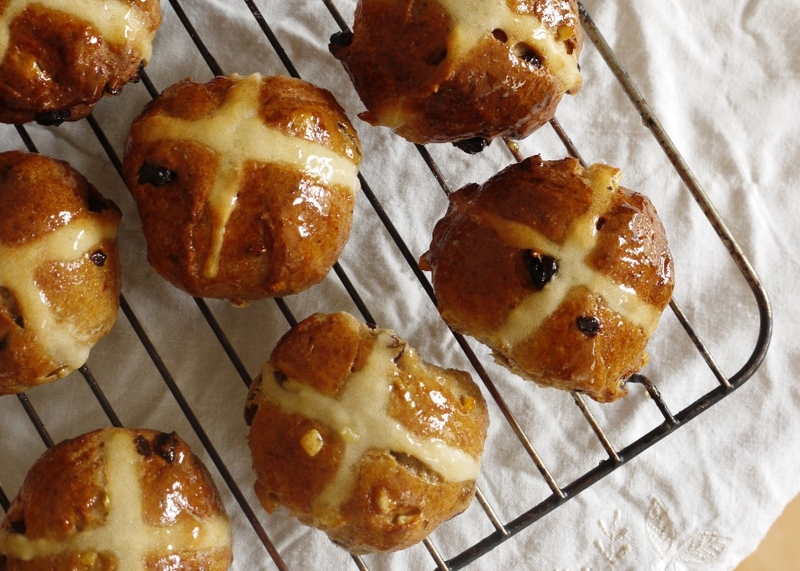 If you haven’t made hot cross buns before, you’re in for a treat. The crumb is soft and light, rich with spice and packed with plump juicy fruit while the crust is golden and delicious, glazed with a sticky sweet syrup to give its trademark shine. Everyone seems to have a signature recipe, but read enough and you’ll realise that they’re pretty much all slight variations on a theme. One hot cross bun is never enough . . . Mix the flours, yeast, salt, sugar (if using) and spices together in a large bowl. In a small pan, melt the butter then remove from the heat and stir in the milk. Add the orange zest then beat in the egg. Make a well in the flour mixture and pour in your tepid milk mixture, bringing together to form a soft dough. Knead on a lightly floured work surface for about five minutes or until stretchy and elastic. You could also do this in a stand mixer fitted with the dough hook on low speed for about five minutes. Once your dough is almost ready, flatten it out and sprinkle over the raisins, sultanas and mixed peel. Push them into the dough, then continue to knead for a couple of minutes more until fully incorporated. Shape the dough into a ball and put in a lightly oiled bowl. Cover with a tea towel and set aside to prove until doubled in size, about one hour. Tip the risen dough onto a lightly floured surface and flatten slightly. Divide into thirteen pieces of about 80g (a baker’s dozen), shape each one into a round and place on a baking tray lined with parchment, about 2cm apart. Cover with a tea towel and set aside to prove for a further 40 minutes. Preheat the oven to 200 degrees C. To make the crosses, mix the flour with about 4 tbsp water or until a thick paste forms. Fill a piping bag fitted with a small nozzle (or cut the corner off a sandwich bag). Slash the tops of each bun with a cross then pipe the flour paste into each cross. Bake for 20-25 minutes or until a lovely golden colour. Gently heat the golden syrup in a small pan. Remove the buns from the oven and brush all over with sticky syrup. Allow to cool slightly before serving. To enter this month’s challenge, all you need to do is visit Purely Food HERE for all the details. Ohh! I baked up a batch yesterday- posting later this week and I’ll definately be linking to this brilliant challenge! And your story of your April Fool’s definitely your boyfriend brought tears of laughter to my eyes! Fantastic Fools!! Ooh! I actually made some of these and posted about them yesterday (March 31st)! Not sure if that would count for April’s challenge, but I’ll have a think anyway about doing a variant. You can never have too many hot cross buns can you? Ooh, I have some in the oven this very moment so will link up my post! Thanks! Oh I see! I didn’t know what you meant for a little while – I had to go away and confirm that I knew the definition of anthropomorphises… I do and I understand :D. I can’t say that I agree, then again I’ve never really considered it. Anywho, these look bloody incredible. 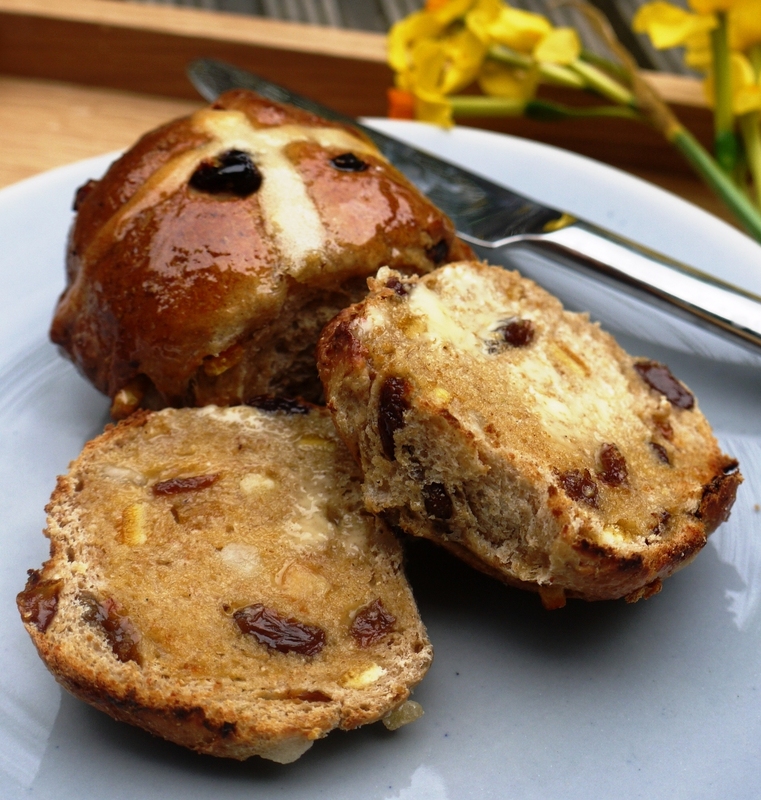 I had my own designs on making hot cross buns this week – we shall have to see what I come up with! These buns look exquisite – how delightfully crispy and wonderful! These look great ! I will be making some later this week for Good Friday ! Its a family traditions for me and I can’t wait. I hope you enjoyed these yummy treats ! oh yay! I wanted to make these anyway! Glad that I have a recipe to follow now! Euan – you definitely can’t have too many! And variations are great – I really want to try those chocolate orange ones. Amy – looking forward to reading! Frugal Feeding – looking forward to seeing what you come up with. Samology – it’s a really simple recipe – good luck! These look delicious. I hope to find time to try your recipe as I’ve never made hot cross buns myself. Thank you again for hosting this month’s fresh from the oven for us. Tina – love the idea of including a bit of honey – next time! Trials in Food – do give them a go! Hungry Hinny – do it! These remind me of Easter breakfasts catered by my youth group 🙂 I love it! Your April Fool’s joke cracks me up. My husband would freak. These look so great! Delicious slathered in butter 🙂 mmmmm yum! Awesome challenge and this year I have been thinking about baking some! Ooh I’d never thought of using wholemeal flour. Which is weird as I normally always use wholemeal flour instead of plain. I bet it works really well. These look perfect. I realised my problem the other day – my hot cross buns are never that great and I finally discovered it’s because I space them too far apart for the second rising, so they flatten out like pancakes and turn dry and chewy. Why do no recipes ever state the importance of spacing them quite close to each other? I’m glad yours gives guidelines! Elaina – when I was baking these, that song kept going round and round in my head, I’m sure I played it on the piano too! Elly – the wholemeal flour adds a lovely texture and weight to them, although any more than 50/50 ratio with white and I think they can get a little heavy. I prefer my buns with just little tears at the side, so don’t space them too close together, but I don’t think there’s a right or wrong way to do it. A perfect springtime treat. They look wonderful. What a fun challenge! I’m firmly off the baking wagon at the moment but they are still so pretty I cant help but love the photos (and your April fools story massively appealed to my mature sense of humour…). Yours are so pretty (Well done!) and everything Ive ever baked of Jassys has been TASTY, so I bet that recipe is great too!! HAHAHA! Your practical joke was too funny! You did a great job with the buns. I just want to smear them with butter and have about a dozen for breakfast. Lol. Em – her recipes are awesome, I definitely need to try those chocolate and orange buns. Joanna – the golden syrup definitely adds a lovely glaze. 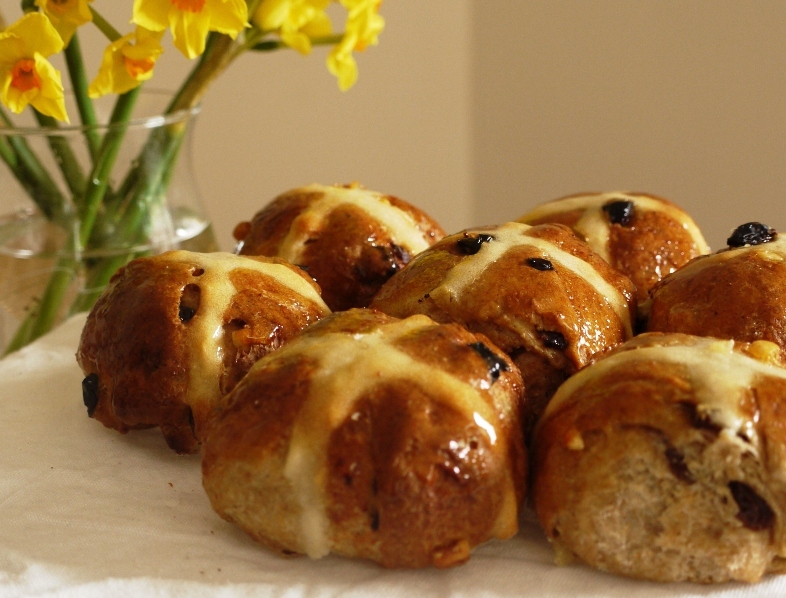 I don’t think our batch will survive until Easter either – another excuse to get baking! My husband announced this year that, due to Sheikh Mohammed’s horse winning the Dubai World Cup of Racing, we all had a day off on Thursday. My teens were absolutely delighted and then absolutely furious when he giggled ‘April Fool’ – they were so cross with him. Must try and fit in some bun baking before Easter – I like the links to all those different recipes. I’ve posted my contribution to the many variations of the hot cross bun; I am looking forward to the end of the month round-up. I just posted mine! I can’t wait to see everyone else’s. Thanks for hosting and for thinking up this delightful challenge! 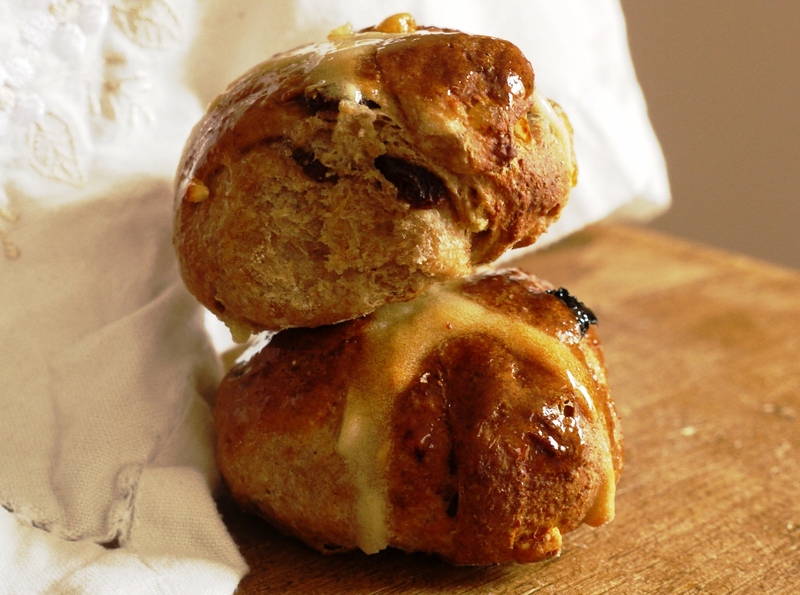 Buns posted – we’re still in Easter week aren’t we?! Looking forward to the round up. PS What do you get if you pour boiling water down a rabbit hole? – Hot cross bunnies! Oh oh, did you say chocolate and orange hot cross buns??? Now why didn’t I think of that? I haven’t made hot cross buns for years and regret it every single time. Yours look lovely. I seem to remember I used to make a glaze of hot milk and sugar, but don’t ask me why. Mmmm… I know Easter’s long over but I missed having these and made them after the fact, meaning my post came a bit after that yet. They were so delicious and it was awesome being able to share something new with a few people! Thanks for the challenge!